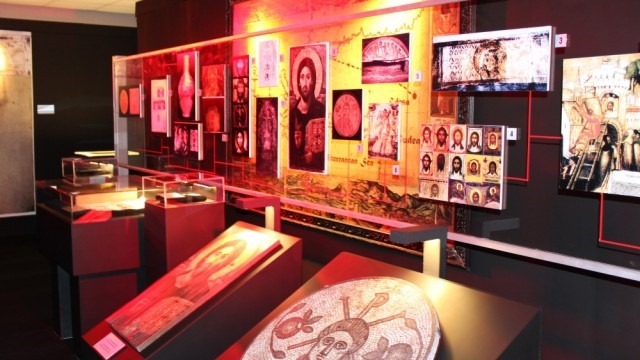 Now the Chaldean News, a newspaper published by the Chaldean community in Metro Detroit has a great story about the outstanding Shroud of Turin exhibit: A Fascinating Mystery: Exhibit Explores the Shroud of Turin. (Chaldeans, according to the newspaper are indigenous people of Iraq, Eastern-rite Christians who speak Aramaic. There are over 100,000 thousand of them in this part of Michigan. The history of the shroud can now be observed at a special exhibition at the former St. John United Methodist Church in Royal Oak until August 17. The entire church has been transformed into a 6,000-square-foot gallery. The exhibit is guided by an audio tour that is one hour long in English, and 1 hour and 25 minutes long in Arabic. It is also available in Russian and Spanish. The entire script has already been translated into Aramaic, but the voice for it has not been found. A male Chaldean who can read Aramaic with a powerful, theatrical voice is being sought to fill the role. Funny, there are 100,000 Chaldeans in the Michigan area and no male Chaldean who can read Aramaic with a powerful, theatrical voice can be found? Bari Conference: A scientific event unprecedented in Puglia Why Doesn’t the Blood Create an Image?